This program is available as an extension of our Morning classes OR as a stand-alone program. Two-month sessions will be based on different themes. 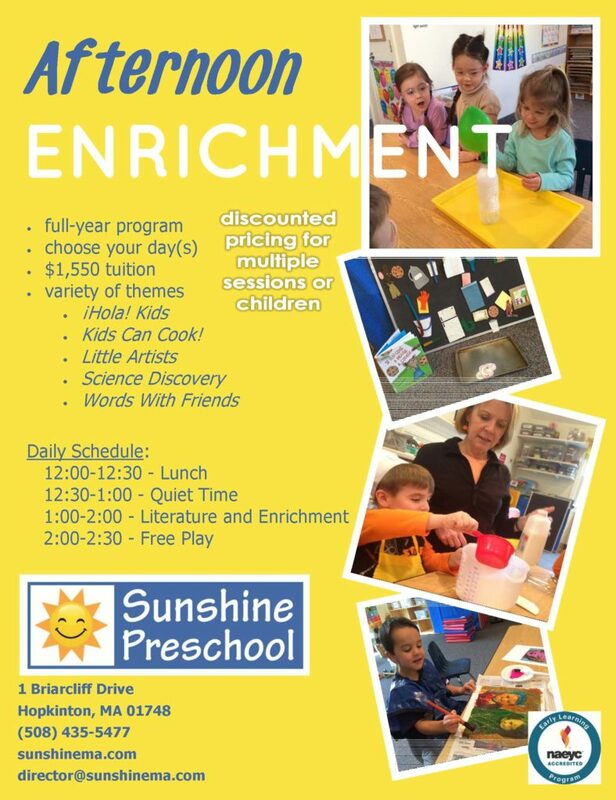 Children not attending our morning program on their Enrichment day can join us for the fun at noon. Following lunch, children participate in a state-mandated 30-minute Quiet Time, during which they look at books, work on puzzles, and listen to music. After Quiet Time, children will explore the theme of the session through children’s literature and a related activity, followed by child-directed play. 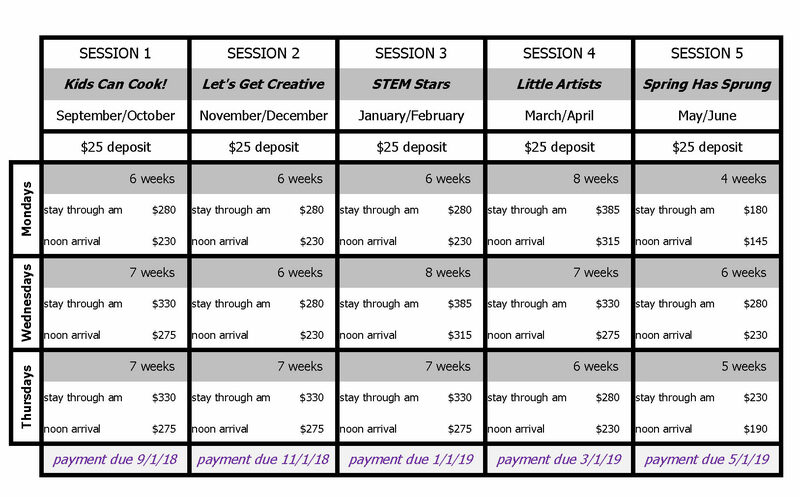 A $25 deposit per daily session is required to hold each child’s space – rates listed in the chart below are based on deposits paid prior to payment due dates listed in purple. Deposits will be returned if we do not have enough students to support running a session and/or program. Click on the link below to register for individual sessions. Upon submission of registration, you will receive an invoice through QuickBooks for the deposit, which can be paid through QuickBooks by credit card or bank account draw, or at school by cash or check. 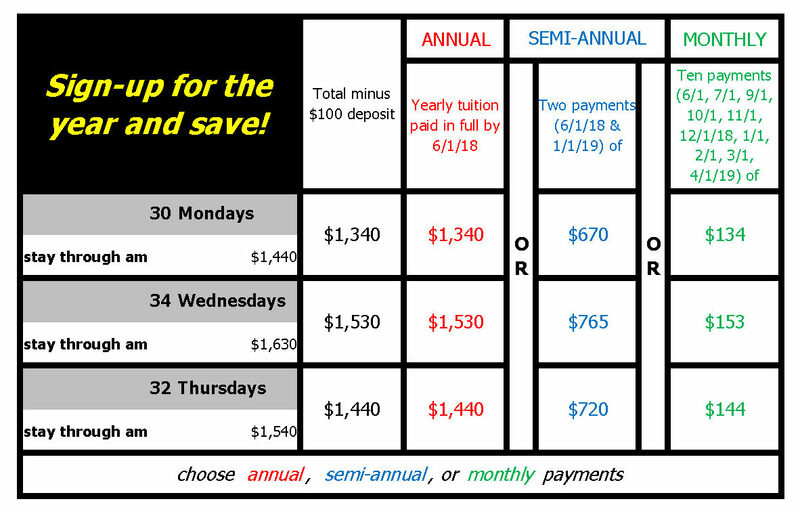 We offer this program as a full-year option as well – see below for discounted year-long rates and payment schedule.